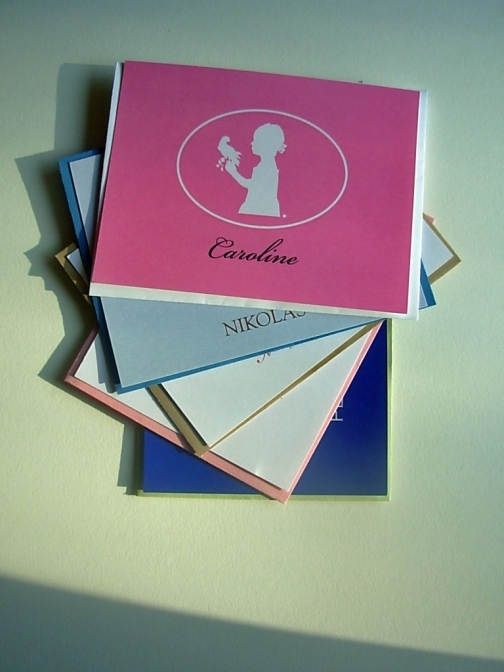 This listing is for a set of 12 children silhouettes flat note cards. They can be customized per your liking - you choose the design(s), color(s), and font. These are fun to use for writing notes or thank yous from your child, a set of these also makes a great gift! Each card, printed on double thick 90 lb cardstock paper, measures 4.25" x 5.5". The cards are paired with colored or white envelopes (your choice). and of course, write the name as you want it to appear on the card. More cards are available upon your request. Contact me for pricing. Other matching stationery such as letter heads or stickers as available as well. Item ships from: Chicago, IL, US. $2.50 USD ($1.00 USD when combined with another item) by First Class Mail. Expedited Rate: $4.60 USD ($3.00 USD when combined with another item) by USPS. I will take returns if the item is sent back within 7 days in the same condition the piece was sent out in. I will return payment once the item has been returned.